We are an entertainment organization that specializes in birthday parties, events, charities/fundraisers, and other venues. Our award-winning Captain Jack Sparrow impersonator aboard his own 35-foot Pirate Ship on wheels, coupled with a cast of colorful characters, can bring a whole new dimension to your party or event. Not only are we constantly creating content for all ages and all pirates big and small, but we are also making good friends, partnering with organizations to create a brighter, happier future on the horizon. Captain's Kids Club​, a division of Main Deck Productions, provides entertainment & services specifically geared towards children. 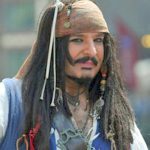 Our award-winning Captain Jack Sparrow impersonator, along with a cast of fun and varied characters, will bring a whole new dimension to your child’s birthday party. From Pirates and Princesses to Mermaids and Face Painters, we have something for everyone!